The septum is the structure which divides the left and right nasal air passages. The majority of this is formed by a sheet of cartilage. 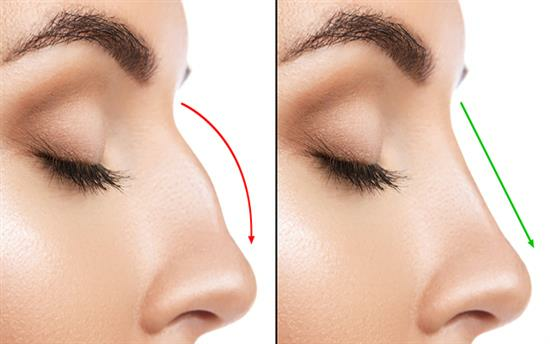 A rhinoplasty that involves surgery to the septum is called septorhinoplasty. Rhinoplasty to correct a deviated septum can benefit a patient both functionally to improve breathing but also aesthetically. A deviated septum can occur naturally as a result of trauma. Although around 80% of people have some level of septum deviation, an extreme deviation of the septum can cause issues. The deviation can cause a breathing problems, but the deviation is severe it can also result in the external appearance of the nose to deviate. Septorhinoplasty involves both surgery and correct externalization of the septum. Usually, this involves carrying out an open approach which leaves a scar on the columella which is the narrow skin bridge between both nostrils. Usually, the deviated part of the septum is removed during the septal correction. Occasionally the removed section of the septum can be used as an alternative to the straight septum. This is referred to as a graft spreader. The spreader is also important to further widen an important part of the nasal airway to improve breathing. All rhinoplasty surgery is performed under general anaesthetic, meaning you will be asleep when you have it done. Mr. Chana works with highly qualified and experienced anaesthetists to ensure your total safety and comfort. You will be required to wear a splint after your surgery for approximately 7 days. You should expect some swelling and bruising– this is normal, and nothing to worry about. It is advisable that you take at least a week off work to aid your recovery – possibly longer. Mr. Chana will speak to you in more detail about how long your personal recovery is likely to take during your surgical consultation. Even after you return to work you should avoid strenuous activities like sports for around six weeks after surgery. Your ‘new’ nose might take a while to look its best because as well as the swelling subsiding, the bone and cartilage need time to ‘settle’ into the face. A rhinoplasty is a very intricate and personal procedure that can improve the appearance of your face. For this reason, particularly, it is imperative that you have a thorough consultation with an appropriately experienced plastic surgeon prior to surgery. If you are interested in having a consultation to discuss Septorhinoplasty with Mr. Jag Chana you’ll be pleased to know that he has often been asked to comment on rhinoplasty procedures in the press. His name was put forward as one of the best rhinoplasty surgeons to feature in the Sunday Times and the Daily Telegraph. During a consultation, Mr. Chana will be able to assess your individual needs and will be able to discuss the results. From there, he will manage your expectations accordingly, and you will be able to come to a conclusion about how your new nose should look. The most important consideration, of course, is that the final result to be in harmony with the rest of the face. Mr. Chana places special emphasis on subtle and bespoke results. As a long list of patients, he has a thorough understanding of the face and the facial structure. Visiting a facial expert is absolutely imperative to get the results you want.